$6,500 + One month free $6,000 per month!!! Grande One Bedroom Looking into Central Park from Every Room! 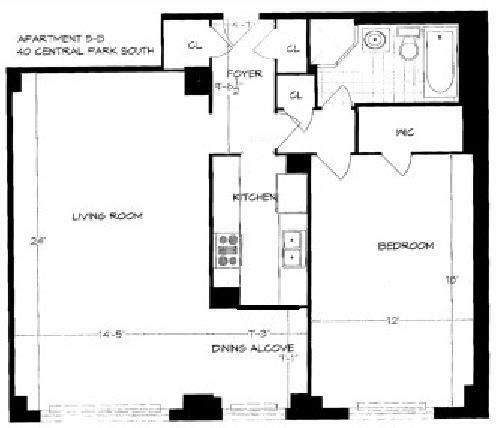 This oversize one bedroom apartment spreads out to nearly 1000 square feet, all of which is usable and holds a purpose. The ceilings are extremely high and there are many original details, giving it a classic yet refined feel. The living room is extra long giving you many different arrangement opportunities. The huge wall of windows on one end looks directly into the lush forest of trees of Central Park. The kitchen has nice finishes and plenty of counter space. On the other end of the living room is a dining alcove or library which is next to the windows viewing the park, perfect for a table to sit and eat or sit and read while the light and energy of the park pours in. The bedroom itself is also extremely large, with a large walk-in closet (one of four closets in the apartment) and more park views. There is more than enough room for a King bed with the accompanying furniture. There is a large en-suite bathroom that has a soaking cast-iron tub and separate glass stall shower. * Listing courtesy of Essential New York Real Estate.